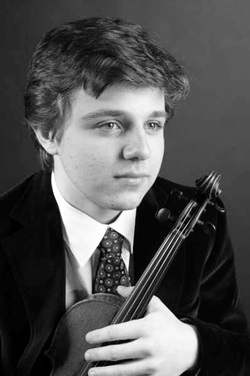 Andrej Power (2nd prize winner of the 1st Stradivarius International Violin Competition) was born on the 21st of January 1988. New Years day 1992 he began to play the violin, at the age of 3. Soon he began to play concerts with orchestras and appeared in different television shows in Sweden. He played his first concert with a chamber orchestra when he was 7 years old, performing the Bach A-minor concerto. Three years later he played Wieniawski’s concerto no. 2 with a symphony orchestra. Andrej went to his first competition, “Berlinske Tidende” held in Copenhagen, when he was 10 years old. There he won 1st prize and the grand prize as the talent of the year. During Andrej’s career he has had the chance to tour in many countries, including Finland, Norway, Denmark, England, Poland, France, Hungary, Estonia, Latvia, Italy, Belgium, Switzerland, Germany, Portugal, USA, Ukraine, Manaco and China. In June 2001 he performed in the Swedish Kings and Queens 25th wedding anniversary gala; there Andrej played Pablo de Sarasate’s “Carmen Fantasie” together with the Swedish Royal Opera House Orchestra. One month later, Andrej went to Italy to compete in the “Rovere d’oro” competition. Andrej won 1st prize and a special prize given to the best string player in the competition in all categories. In 2003 Andrej started his studies at the Royal College of Music in Stockholm with Professor Henryk Kowalski. In February 2004 he won the Swedish Finals for the Eurovision grand prix for young musicians and became the Swedish representative in the European Finals held in Lucerne, Switzerland. During the summer of 2005 Andrej traveled to the USA for concerts and to have summer courses at Indiana University School of Music. While attending Indiana Andrej studyied with Prof. Kowalski and had masterclasses with Jamie Laredo and Janos Starker. In October 2005 Andrej was invited to Ukraine to play Wieniawski concerto no. 1 in F-sharp minor with the Jalta Symphony Orchestra; later in October 2005, Andrej traveled to China to play with the Beijing National Opera Orchestra, both concerts were broadcasted on television. In December 2005 Andrej performed in Hungary with the Solti Chamber Orchestra. In September 2006 Andrej started his studies in Switzerland at the Hochschule Musik und Theater Zürich in the class of Professor Zakhar Bron. In the summer of 2007 Andrej is going to participate in the “Ozawa Summer Music Academy” and the “Verbier Festival Summer Academy”. Andrej plays a Mattio Goffriller violin made in Venice 1695.